Your zip code as it is recorded in your chart. For both registration and post-registration access, the Patient Portal website can be accessed via the ‘Patient Portal’ buttons above. 1. Select the Patient Registration link above. This will open the registration page in a new tab, so that you can continue to reference these instructions. Please note: all fields must specifically match the information that Derick Dermatology has on file. 2. You will be asked to create a unique username. The username field will indicate whether the username is already taken or not with a green check, or a red X as seen below. 3. When you have selected a username that passes the availability check, continue on to create your password. Type your chosen password into both the Password and Confirm Password fields. 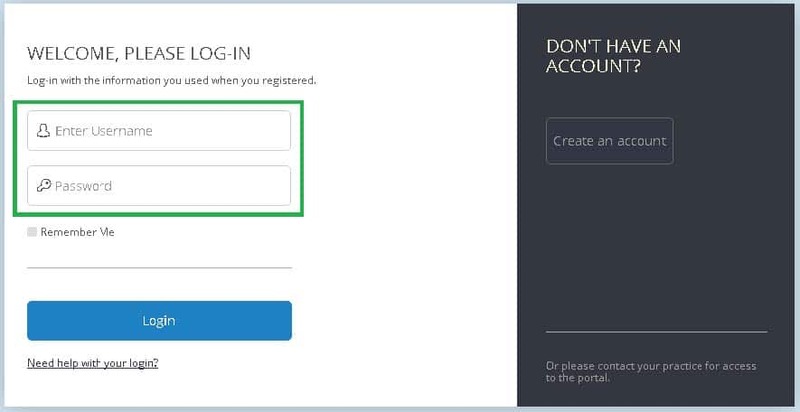 Please note that if the passwords do not match, you will be alerted to this when you click the Create Account button at the end of the registration process. If you receive this error, simply retype your passwords to match. 4. Next, fill in the First Name, Last Name, Date of Birth, and Zip fields with the information that matches your chart at Derick Dermatology. If any of your information needs to be updated, please call our Scheduling department at (847) 381-8899, option 1 and we will assist updating your chart. 5. Once you have entered your personal information, you will need to enter your Security Code. This will have been provided in an email. If you have lost this number, please call our Scheduling department at (847)381-8899, option 1 and we will help you recover it. 6. Next, fill the checkbox indicating that you accept the Terms and Conditions which can be found by clicking the link “Terms and Conditions”. 7. Finally, click the “Create Account” button. This will perform a check to make sure all the information provided matches the information in your chart. If any of your information does not match, you will be prompted to review the provided information and correct it. 8. Upon successful completion of this page, you will be taken back to the login page. Here you will login with the username and password you provided earlier. 9. Upon successful login, you will be prompted to answer a few security questions in case you ever forget your password. Simply choose the questions you prefer and enter the answers. Please note: although the same questions appear to be options for all 3 fields, you must select a unique question for each field. 10. Once you have finished the security questions, you will be moved to the Medical Record selection screen. Upon registration, there is just the one registered medical record, but you may add minor children and others for whom you have authorization. It is here that you will choose the record that you wish to view. If you have any issues with the above steps, please feel free to call our Scheduling department, at (847) 381-8899, option 1, and we will be happy to assist.